Q.What is the objective of the Terrain Camera onboard KAGUYA? What makes it different from other cameras developed for lunar exploration? Alpine Valley, imaged by KAGUYA's terrain camera. There is a small meandering valley within the larger valley. Evidence of a lava flow called a rille. 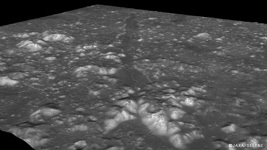 The Hadley Rille and its vicinity, imaged by KAGUYA's Terrain Camera. 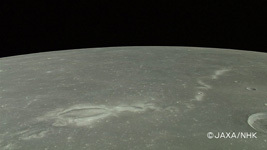 The main purpose of the Terrain Camera is to map the Moon's entire surface. With its 10-meter resolution, the instrument can take three-dimensional images of the Moon using two cameras, which face fore and aft, respectively. The Terrain Camera is the first high-resolution camera to capture three-dimensional topographic images of the surface of the entire globe. Another important feature of the camera is its ability to take images of very dark and very bright places. Q. What are the most anticipated outcomes from KAGUYA today? The two major results so far are: 1) confirmation that there is no significant amount of water ice on the surface of Shackleton Crater at the lunar South Pole; and 2) confirmation that volcanism continued until 2.5 billion years ago at the lunar maria on the farside. I think it's very important to build on these two results. First of all, I would like to examine water ice at the North Pole. The U.S. Lunar Prospector spacecraft, launched in 1998, discovered hydrogen concentration at the lunar polar regions. Some research indicates that there is more hydrogen concentration at the North Pole. I am interested in finding out if there is any water ice near there, in permanent shadow. I am also interested in measuring the age of the lunar nearside. So far, research has indicated that the Moon's nearside was volcanically active until about one billion years ago. This work was based on data collected by the Apollo and Lunar Orbiter missions, but some of that data contains a lot of noise. So, based on the new data obtained by KAGUYA's Terrain Camera, I would like to compile a more accurate chronology of the entire globe based on crater counting. (Crater counting determines the age of a region based on the number of craters: the more craters, the older the area). 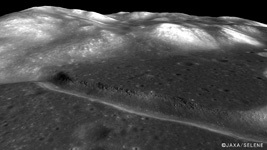 The terrain camera has revealed many unique terrains on the Moon's surface, for example: 1) evidence of lava channels called rilles; 2) crater-shaped terrains from which it looks like something spouted; 3) terrains that look like the collapsed roof of a lava tube (a cave created by a lava flow). I anticipate that data analysis and examination of these terrains will contribute to new discoveries that will explain the evolution and history of the Moon. Q. What attracts you to the Moon? It's the distance. The Moon is the nearest celestial body to Earth. I would love to go to space someday, and if that can ever happen, it will probably be to the Moon, since it is most easily accessible from Earth. In addition, the Moon can give us a great amount of observation data because the distance makes it easier to explore. The U.S. Apollo mission returned 382 kilograms of rock and sand samples from the Moon. Thanks to this data, the Moon has been studied in far greater detail than other planets. In the future, Japan plans to develop an unmanned lander, which would help us understand the Moon more comprehensively. It was really wonderful to be able to use the terrain camera to have a close look at the entire Moon. It made me glad to be a researcher. I was especially thrilled when I was able to confirm that our Terrain Camera had successfully imaged the area of permanent shadow in the Shackleton Crater at the South Pole. 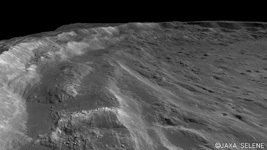 This was achieved thanks to the camera's high sensitivity, as the crater floor was only faintly lit by sunlight scattered from its inner wall. I couldn't keep my eyes off the high-resolution data of the Shackleton Crater that night. It brought me to tears - my associates and I had worked so hard for more than ten years, and our efforts had finally paid off. The lunar polar regions are good candidates for the construction of a lunar base, because there is hope that these regions have water, and there is not much difference in temperature between night and day. For these reasons, there's a better chance for humans to go there in the future. It's very exciting to imagine the day when someone actually lands at the South Pole and looks at the Shackleton Crater, remembering that its inside was first imaged by Japan's KAGUYA. Q. Could you tell us about your research plan? I would like to investigate the history of comet impact on the Moon. When I was a graduate student, I studied the formation and evolution of comets as well as their interior structure. I was interested in comets because their impact on Earth is believed to have been a potential source of organic matter that eventually produced life. Also, there is the possibility of ice in the polar regions of the Moon. One hypothesis suggests that water vapor produced by comet impact moved to the polar regions and was trapped there in the form of ice. We've observed many unique terrains on the Moon, including a spiral pattern that could be evidence of comet impact. I would like to study how these patters developed, and their relation to comet impact. Q. What are your hopes for future lunar exploration? 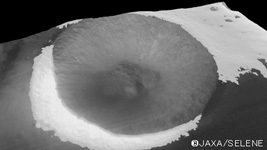 North wall of the Tycho Crater imaged by KAGUYA's Terrain Camera. The inner wall is terraced. Before the launch of KAGUYA, people often said to me that the era of lunar exploration was over and that the next era would be about studying the details. They said KAGUYA's role was simply to conduct closer investigation based on accumulated data. But in fact, since KAGUYA started observing the Moon with its advanced onboard instruments, it has been continually making new discoveries. I think the Moon is still a place for us to explore, and there is still a lot to be discovered. I hope that data from KAGUYA will continue to help lunar exploration to flourish. I also believe that international cooperation will become more important than ever. I would like to use data acquired by KAGUYA and other lunar explorers to collaborate with researchers around the world, and to encourage others to join in the collaboration as well. And it will be my great pleasure if our research results can get the public more interested in space and science. I hope to continue to take part in Japan's lunar and planetary exploration. Before KAGUYA, there was no choice but to use data obtained by foreign lunar spacecraft in our research. Now, being in the position to provide observation data to others, I realized that data calibration is not as easy as I had imagined. In addition to KAGUYA's significant scientific results, we also gained the valuable experience of doing everything ourselves: from defining observation objectives; to developing instruments and ground-control processing software; to operating the instruments and spacecraft; to calibrating, correcting and analyzing data. This has given us great confidence. I am sure that this experience will be applied to future lunar and planetary exploration, contributing to new discoveries as well as to the development of brand new fields. Dr. Haruyama received his Ph.D. from the Graduate School of Science at Kyoto University. After working as a visiting fellow at the California Institute of Technology, and as a senior research associate at the National Space Development Agency (NASDA, now part of JAXA), he was appointed to his current position in 2007. He was Principal Investigator for the Terrain Camera on board KAGUYA, which was launched in 2007.